Unless you indulged in a series of prolonged naps on Friday, you probably realized at one point or another that the date was November 11, 2011, or, more popularly, 11-11-11. The hype was hard to miss—and yet the prior week’s palindromic date of 11-02-2011 somehow slid by greatly unnoticed. The early years of a century naturally give us more of these kinds of dates, but 11-11-11 stands out because it is a repunit number and reads the same forwards, backwards, and upside down. Wedding chapels were booked solid on Friday, stores planned grand openings at exactly 11:11, and the internet offered no shortage of numerological explanations and predictions—both hopeful and dire—for this noteworthy date. I didn’t buy into any of that, but I do confess to having a bit of number superstition. Where my writing is concerned, I prefer it if a manuscript’s word count is a nice round “lucky-looking” number, and I will usually do my final tweaking with that in mind. Additionally, I’ve long had an affinity for the time of 11:11—on a digital clock, it’s just so darn symmetrical—and having it occur on 11-11-11 was too much for me to ignore. So I gave some thought as to what I wanted to be doing when the potentially-auspicious time rolled around. Standing in the checkout line at Target? Uh, no. Exercising? Always a healthy choice, but, again, no. Having been inspired by Dylan’s Writing Bug post to increase my productivity in November, I knew I wanted to be writing. I set my most accurate clock on my desk, opened a pristine Word document, and, when 11:11 arrived, I wrote the first sentence of a new project that has been rolling around in my head for a while. 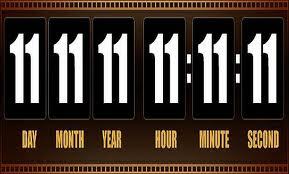 My attention to 11:11 11-11-11 was merely a symbolic gesture. I don’t really believe that the confluence of all those number ones will change my luck, because the act of writing isn’t about luck. (Some might say other facets of the business are, but that’s a topic for another time.) Writing is work, and it requires commitment, diligence, and effort. Any time of any day. Friday was also Veteran’s Day, and I’d like to extend my gratitude to the brave men and women who have served, are serving, or will someday serve this country. Do you have writing superstitions, numerical or otherwise? Unfortunately, I taught right through 11-11-11-11-11. Many of my fellow teachers stopped class to make their wishes at 11:11am, but single-minded old me? I just plowed right through and forgot. Weirdly enough, I was multi-tasking this morning, pulling a name from my prize jar for last week and simultaneously reminding students checking for parent signatures in the agenda to mark the chart for Friday's date. "It was 11-11-11!" called out one girl, to remind the students filling out the chart. And just as she called out the number, I pulled that girl's name from the jar. The room was struck with awed silence. Pat, I share that one, too! No writing superstitions yet...maybe after that first big publishing break, I'll realize there was something "special" I did before hand. There is one rock on the Big Thompson River that I always step on before I descend into the canyon...though I'm not sure why.